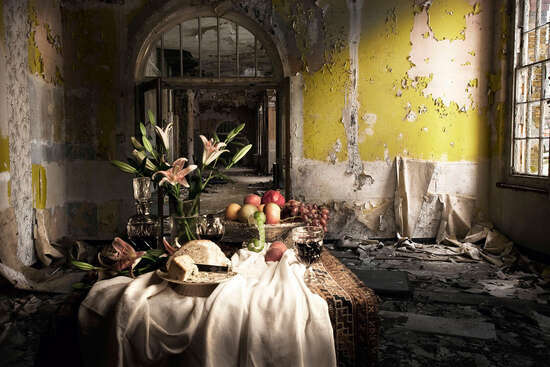 In her remarkable series The Trespasser, Lynne Collins reveals the beauty of transience, using delicate flower arrangements in decaying interiors to create a unique aesthetic tension. 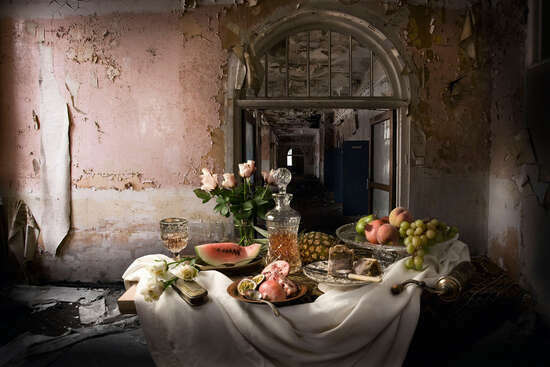 The British artist combines the traditional still life genre with urban exploration. While these elements ostensibly contrast one other, Collins implements them in such a way as to break through the melancholy atmosphere of the abandoned locations, breathing new life into them. After creating the still lifes in a studio, Collins then brings them into a dialogue with the modern ruins through photo montage. 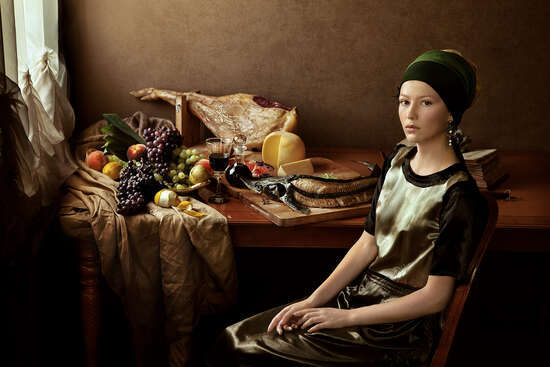 Her careful control over the lighting is reminiscent of the Dutch masters. Collins’ multifaceted works can be interpreted on many different levels. While the images could be read as allegories of time and transience, they also reflect on the supposedly representational nature of photography and explore its relationship to painting. As a child, Lynne Collins became acquainted with the TV & film industry through her parents. For more than 25 years, she has worked as an artist in this field, and her credits include creating models and sculptures for BBC productions. This influence comes through in her photographic works. The artfully arranged, emotionally charged interiors remind us of film sets, bringing the locations and their histories to life in the viewer’s imagination. 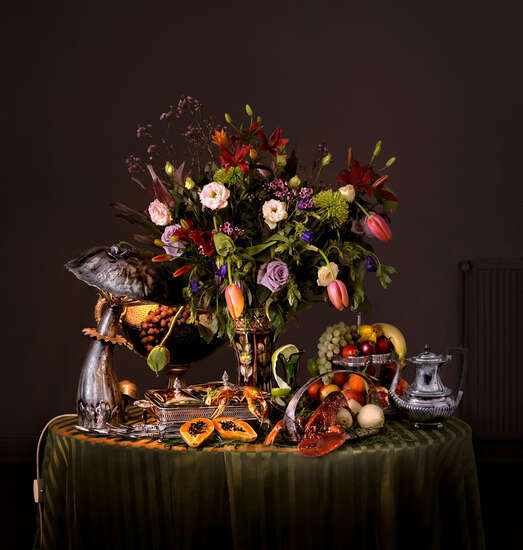 Alongside her diverse artistic endeavours in the film industry, Collins has become increasingly devoted to photography in recent years, making a name for herself in the British art scene. Her work has received multiple prizes and has appeared in numerous exhibitions and galleries, including London’s Somerset House. Lynne Collins’ photography is characterized by a meticulous research and a passion for adventure. 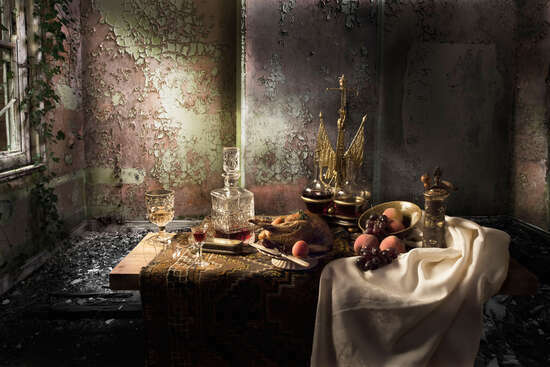 In preparation for The Trespasser, she visited abandoned buildings in South East London and delved deep into 17th century Dutch painting, which served as the template for her still lifes. The artist was particularly fascinated by Cane Hill hospital, an historical psychiatric hospital in South London that was abandoned in 1991. She repeatedly visited the derelict buildings with her husband before they were finally demolished in 2010. Collins was as interested in the decay of the structures as she was in the history of the location. 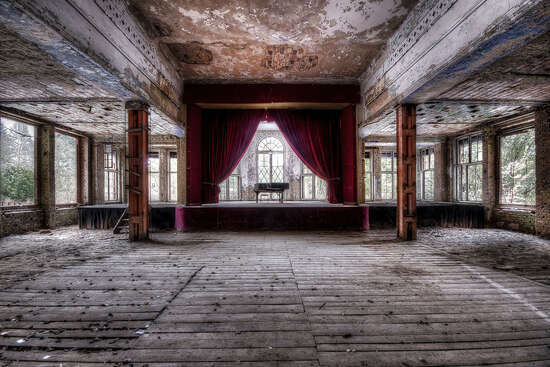 A human presence in the building manifests itself through the personal effects that have been left behind, creating the remarkable, ghostly atmosphere the artist captures in her photographs. Biographical elements are woven into Collins’ works in another way as well. 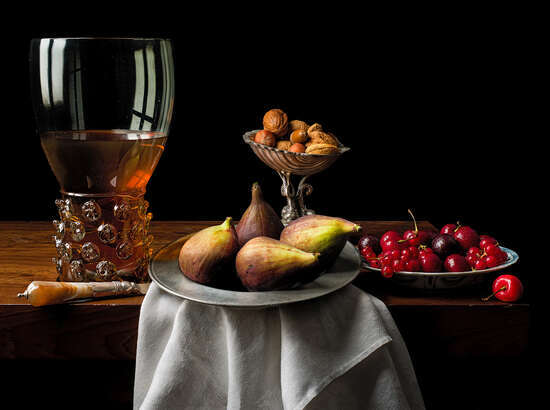 For her still lifes, the artist uses items that belonged to her late mother, thereby integrating her own life story into the broader context of time and transience. 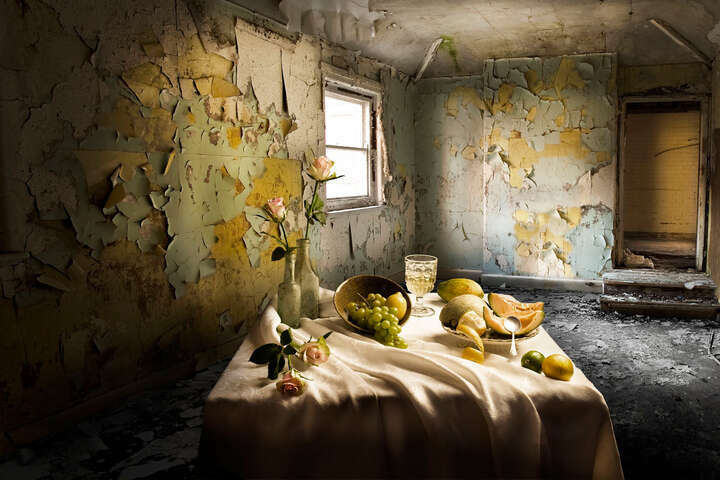 Lynne Collins is a self-taught photographic artist living and working in London. UK. She had private art training in painting, sculpture and drawing, which opened up a 25 year career in the film and television industry. Her sculpture and paintings have featured in television dramas, big feature films and on magazine covers. Collins went on to make her own films and worked as a film editor for a small company before turning to the still photographic image. Her experience working on film sets, politics and the environment are the main influence for her images.